Tomorrow, the MESSENGER probe will fly by Venus en route to Mercury. The aim of the mission is to orbit Mercury, but this is a difficult task. If you just try to shoot straight for it, your probe will pick up speed as it falls towards the sun, so by the time you get to Mercury you will be going so fast that you’ll need a whopping great big engine to slow the spacecraft down enough to go into orbit, instead of just shooting on past. The Messenger mission is instead using gravitational assists to slow down in stages. So far, it has done an Earth fly-by and a Venus fly-by, and after tomorrow’s Venus flyby there will be three Mercury fly-bys before it slows down enough for orbital insertion. Fortunately, there will be ample opportunities to take pictures during each of these fly bys, which is a good thing. Because we only actually have pictures from one half of the planet so far. The figure shows a very simplified diagram of this gradual decrease in orbit. 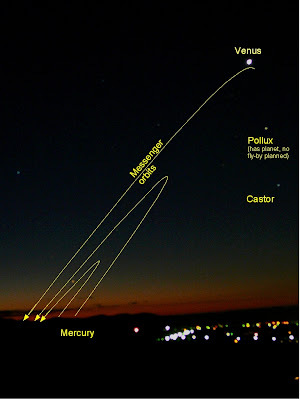 Venus is top right, Mercury is bottom left, and a very schematic orbital path is shown in yellow. Of course, by the time the spacecraft gets to Mercury, it will have done more than two orbits around the sun, so all the planets will be in different positions than they are now. And the spacecraft will not have a fly by every orbit- it doesn’t actually get to Mercury orbit until 2011, although the first fly by is next year.